The U.S. economy rebounded from the hurricanes and added 261,000 jobs, the best performance of the Trump administration. 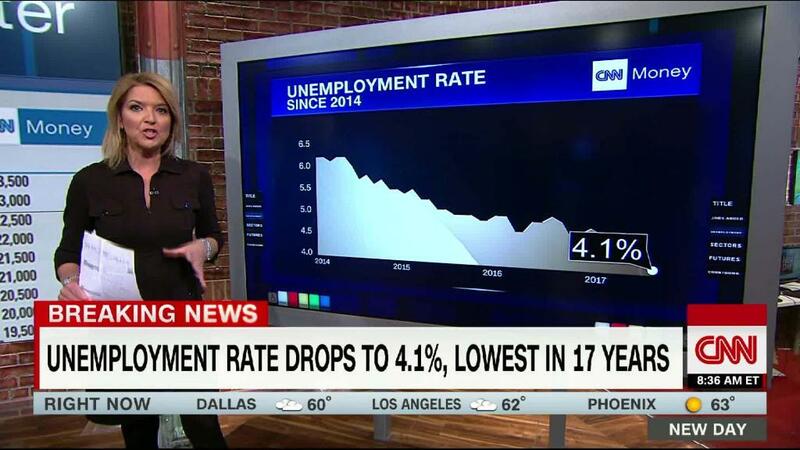 Unemployment inched down to 4.1%, the lowest since December 2000. "This labor market is still really firing on all cylinders," says Scott Anderson, chief economist at Bank of the West in San Francisco. But wages took a step back. They grew only 2.4% in October compared with a year earlier, behind September's number. The absence of better wage growth and inflation is one of the biggest mysteries in the economy. The United States has added jobs for 85 straight months, the longest streak on record. The government first estimated that the economy lost 33,000 jobs in September because of Hurricanes Harvey and Irma. Revised figures show a gain of 18,000 instead. The job gains for October were across the board. Restaurants reopened after the storms, adding 89,000 jobs after losing roughly the same amount in September. Business services gained 50,000 positions. Health care firms hired 22,000 employees. Manufacturing kept growing. The industry gained 24,000 positions in October. Since the U.S. presidential election last year, manufacturing has gained a strong 156,000 jobs. Economists attribute those gains to the renewed strength of the global economy and a weak U.S. dollar, which makes American exports more affordable for foreigners to buy. Manufacturing firms rely heavily on shipping and selling abroad. Improved technology is persuading some U.S. companies to stay local, too, experts add. "The cost differences are starting to make more sense for companies to produce more goods in America," says Cathy Barrera, chief economist at ZipRecruiter. There were some concerning figures in the report. More than 700,000 Americans left the labor market in October. Although the Labor Department didn't give a reason, that could be because Baby Boomers keep retiring. So the unemployment rate dropped for what economists think of as the wrong reason -- a shrinking labor force, not just more hiring. Some industries also registered minor job losses, such as mining, which lost 2,000 workers, and retail stores, which lost 8,000. Still, the overall picture is very good -- although getting to this point after the financial crisis has been a crawl, economists point out. "You can look it at as a marathon or a sprint. Other expansions were more like a sprint. This is a marathon," says Robert Frick, chief economist at the Navy Federal Credit Union. Another way to put it: "The party can go on for a lot longer. It's just not a wild party."